I'm always and forever interested in products that brighten and even out my skin tone cause you know, redness. Just recently I tried a few new products that quite effectively take care of redness and really work well at reducing it, and I'm using some old favourites as well, so I have to share them with you. First let me mention two face masks I've been really into lately. 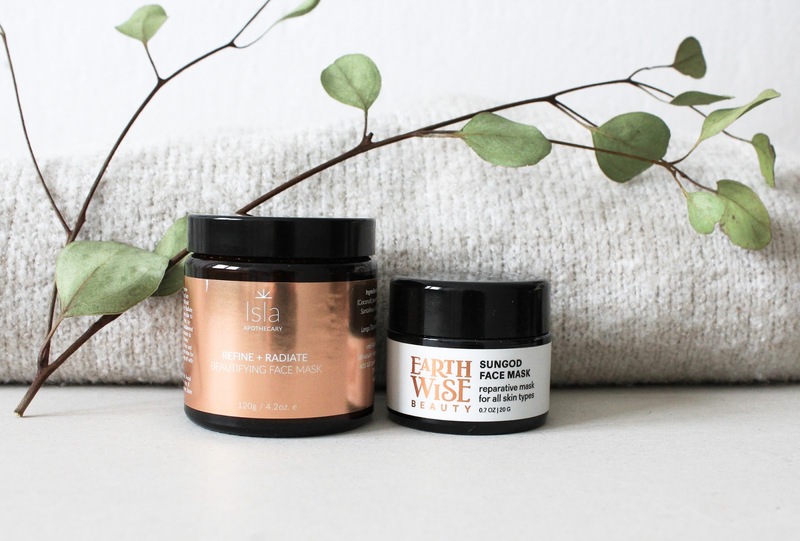 Refine + Radiate Beautifying Mask* from Isla Apothecary is one of them. This mask is such a gem! It contains only three ingredients but three is plenty when a product delivers on its promises. 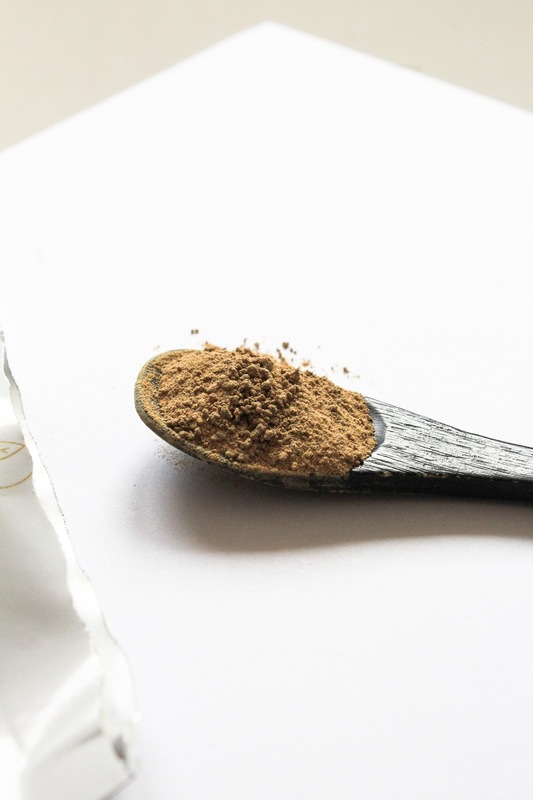 There's organic Coconut Milk Powder, Red Sandalwood Powder and organic Turmeric Root Powder. Done. Drop the mic. Coconut milk is very softening and smoothing to the skin and each time I use this mask I'm like oh my, my skin is so soft! I love it so much. Red Sandalwood supposedly helps to soothe the skin and is great to achieve glowing skin. And then there's Turmeric, a wonderful anti-inflammatory ingredient with brightening benefits. If a product contains turmeric, then I have to have it. The mask is indeed brightening, but also very softening and hydrating because of the coconut milk. It's also gently exfoliating and I just adore it. I love mixing it with water and honey, and lately I've also been mixing it with another mask - Sungod Face Mask* by Earthwise Beauty. You can get Isla Apothecary Refine + Radiate Beautifying Mask here. 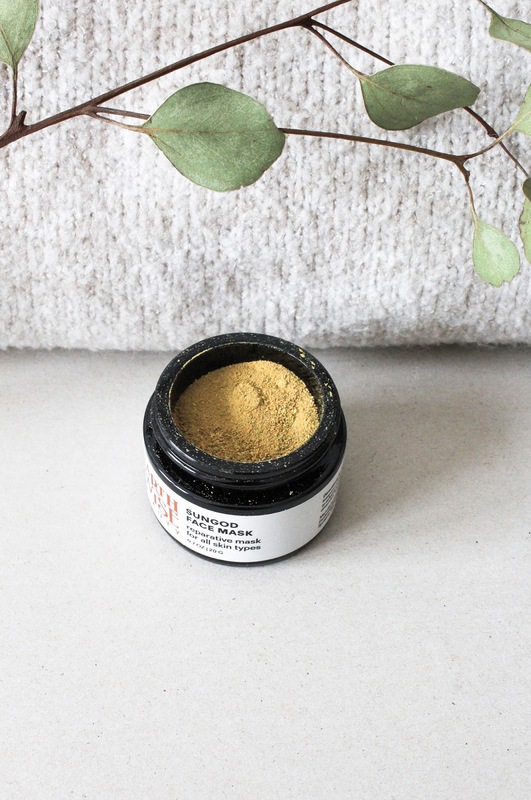 Earthwise Beauty Sungod Face Mask* is not a new product I'm mentioning on my blog and if you remember I also had a very fun giveaway on Instagram (see here) with the fellow EWB mask Catharsis. Sungod is not as instantly- and fast-working brightening mask as is Refine + Radiate. It works over time and when you use it regularly you really see it works beautifully. Sungod isn't even called a brightening mask but a "reparative mask for all skin types". It was designed to gradually yet significantly improve the skin over time. With regular use it helps to reduce signs of aging and heal scars, eczema, psoriasis, and acne. This mask helps to repair and strenghten the skin, and I find that so wonderful. But then it's also brightening and just on a whole it's a gorgeous treat for the skin. A real stunner. It contains Wildflower Pollen, Calendula, Aloe Vera, Shiitake and Maitake Mushrooms, Turmeric as well. There's also a small amount of Fuller's Earth Clay but I don't find it drying. I like that there's no essential oils. It is indeed beautiful and I highly recommend it. Read my full review here. You can get Earthwise Beauty Sungod Face Mask here (my affiliate code "Loveliness" saves you 15%). 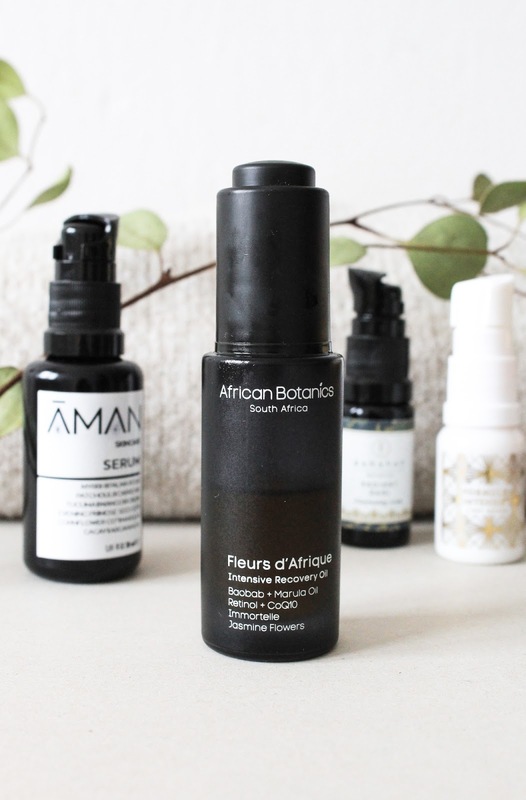 African Botanics Fleurs d'Afrique Intensive Recovery Oil* is THE best oil I've ever tried. It literally transforms my skin through the night and makes it brighter & calmer and also really evens out my skin tone. It plumps up my skin, reduces inflamation and just overall balances it. I can't rave enough about it. This oil is super expensive so I'm saving it like a madwoman, using no more than two drops every night I use it. I was lucky enough to receive it in the August Boxwalla Beauty Box (see my review here) and I used it about half a bottle. There is a bunch of amazing ingredients in it, including plant based Retinol, Kalahari Melon and Marula Seed Oils, Rosehip, Roobios, Honeybush and Jasmine, Rose, Immortelle and Microalgaea. The oil is lightweight and really takes cares of everything on my skin, especially redness and hyperpigmentation. LOVE. You can get African Botanics Fleurs d'Afrique Intensive Recovery Oil here. 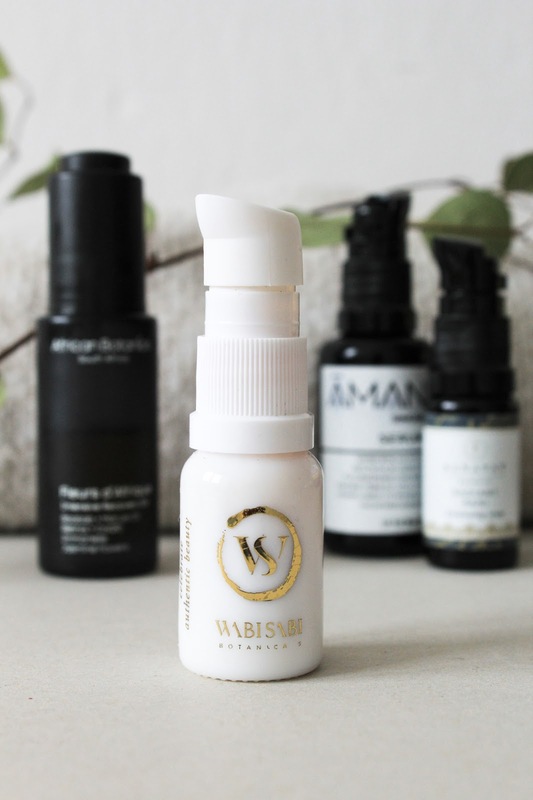 Wabi-Sabi Botanicals Light Reveal Targeted Treatment Serum* (review here) was designed to brighten and lighten your skin. This serum has this amazing, vibrant orange colour and a sweet fruity scent of Pequi Fruit Oil and Guarana, it's so good! There's also Sea Buckthorn, Andiroba and Buriti oils. It's surprisingly lightweight and is instantly absorbed into the skin. This is not an overnight miracle but with regular use you can see a slight difference in reduction of redness and hyperpigmentation. As this is a concentrated formula I use it in combination with another oil serum and I just love the extra boost it gives to my skin. 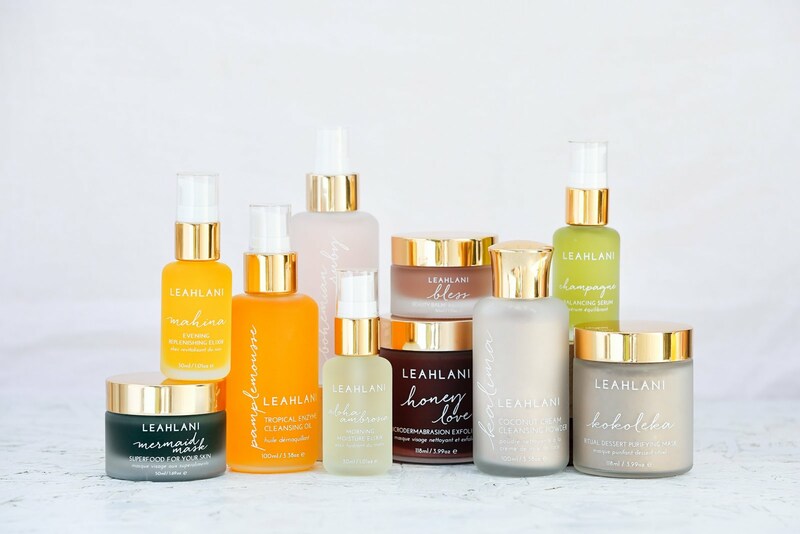 You can get Wabi-Sabi Botanicals Light Reveal Targeted Treatment Serum here or in one of the Indie Beauty Spotlight Discoveries by Beauty Heroes (check it out here). 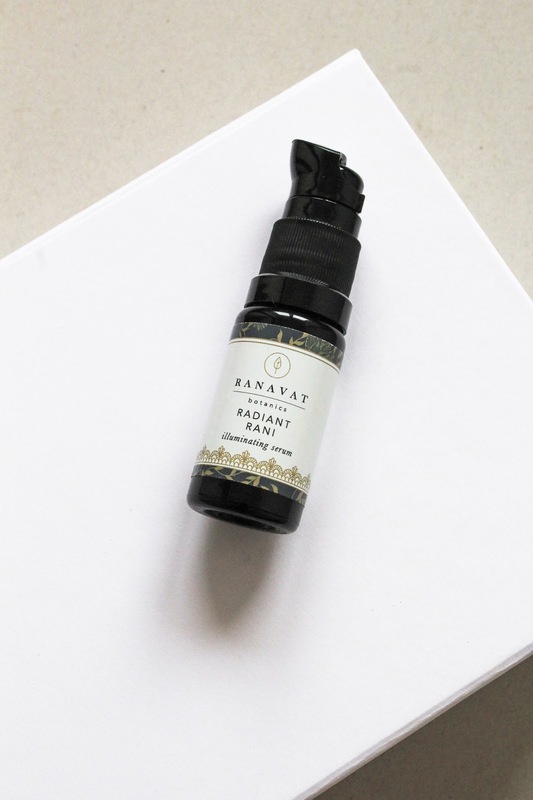 Ranavat Botanics Radiant Rani Illuminating Serum* is an oil that quickly impressed me and that doesn't happen that often with oils. If you missed my previous post, I just reviewed this oil actually (you can read the article here). Radiant Rani smells like Rose with a hint of spice and I really enjoy it. It contains Sesame and Rice Bran Oils, Turmeric, Saffron, Nutgrass, Vetiver, Licorice Root, Himalayan Cherry, Indian Barberry and more. Since I only have a small bottle of the oil, I'm using it like the Light Reveal from Wabi-Sabi Botanicals, more like a treatment. The two work beautifully together. 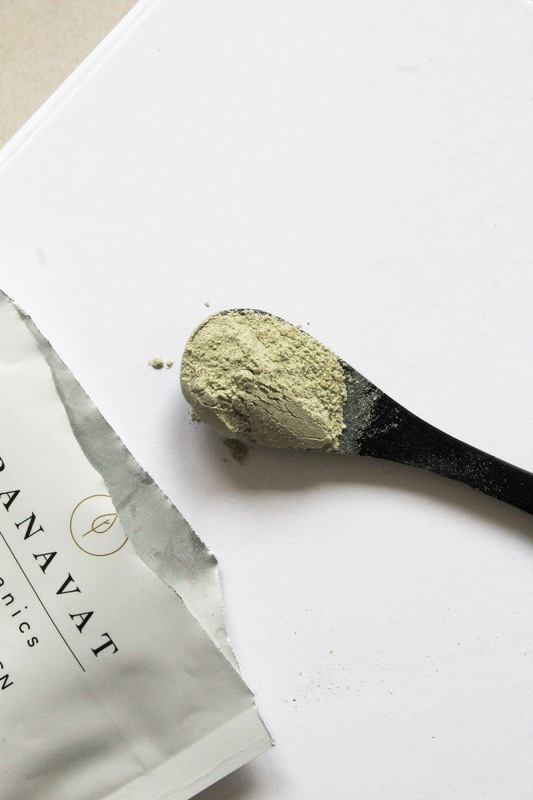 I had a feeling I would like Ranavat Botanics but their products really impressed me more than I thought. Radiant Runi is brightening and makes my skin more radiant and glowing. I like. 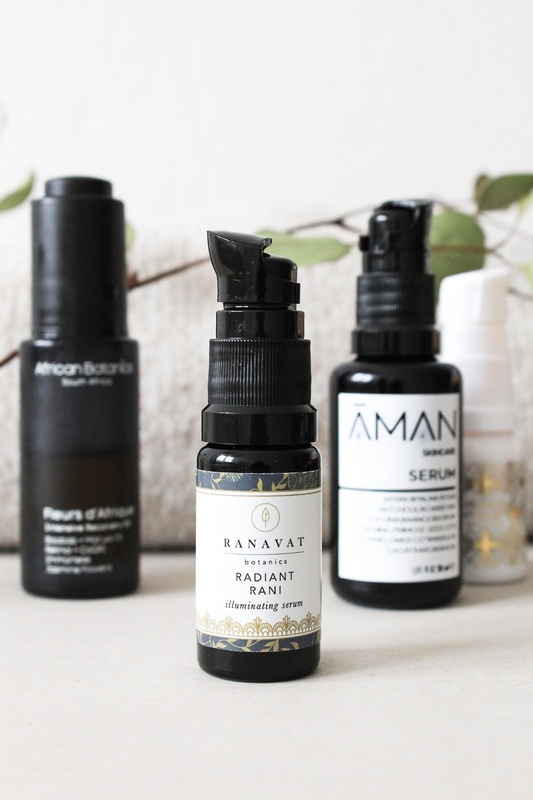 You can get Ranavat Botanics Radiant Rani Illuminating Serum here or in one of the Indie Beauty Spotlight Discoveries by Beauty Heroes (see here). 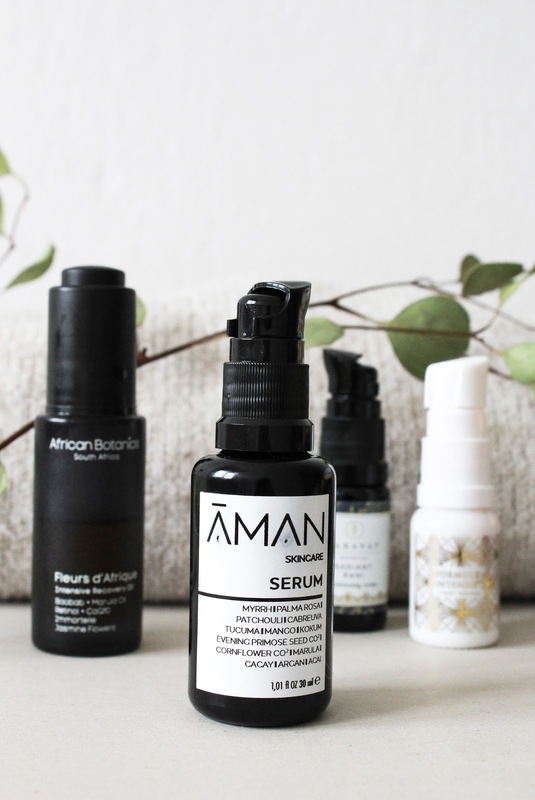 Emanufaktur Aman Skincare Serum* is my newest facial oil and I simply have to mention it in this post because it also contains Turmeric, and I have a feeling it will help to reduce redness and brighten my skin. I have only used it a few times thus far but I really like it. When you check out the ingredients in Serum you can't help yourself but to say ooh and aah, cause the ingredient list is just wow. It's very long so I won't go into it too much, but to quickly name a few ingredients there are Papaya, Argan, Acai, Strawberry, Avocado, Tucuma & Capuacu Butter, Oats, Chamomile and more. This oil is actually a "liquid balm", meaning it's not as liquidy and oily as oil serums usually are. It's more thick (Light Reveal from Wabi-Sabi Botanicals is also more of a liquid balm) but then at the same time it's also lightweight and non-greasy. It's more of a dry oil so it doesn't feel heavy and is quickly absorbed into the skin. It's very lovely. The scent is quite strong, it's citron scent. I would prefer if it was a bit more delicate and non-invasive but I'm sure I'll get used to it. I will use it for weeks to come to really see if it works but so far I'm impressed. You can get Emanufaktur Aman Skincare Serum here. Lastly I want to mention the product that probably helps the most with hyperpigmentation - Rose Quartz Gua Sha Tool. If you haven't heard of gua sha then I'm sorry but where do you live?? It's been all the rave for the last few years and this year especially. 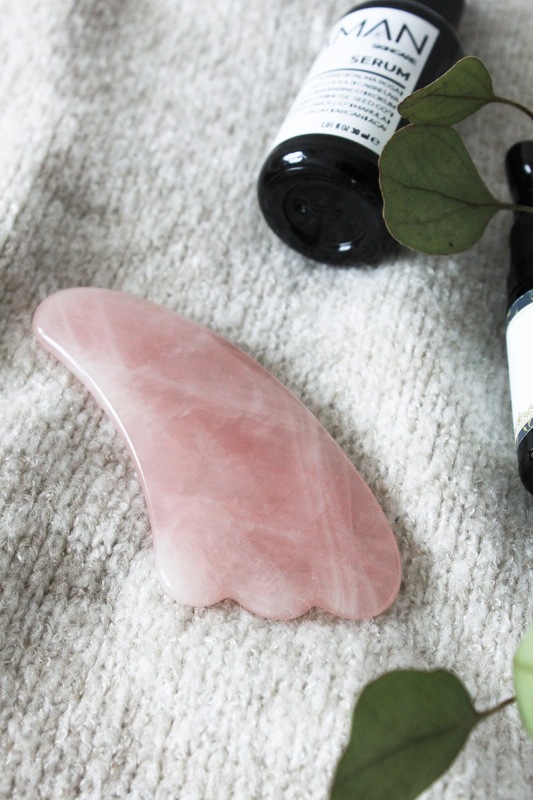 Gua sha tools and jade rollers are the beauty tools every single blogger, youtuber, beauty obsessed person has and a regular use of them can make such a huge difference in my skin. I'm very lazy when it comes to using them but when I do use my rose quartz gua sha tool every day, I swear my skin looks better than it did in a long time. It's all thanks to lympatic drainage and massage that these tools provide and used with a good serum or balm, it doubles the benefits. My skin overall is more radiant, less inflammed, hyperpigmentation is greatly reduces, it is plumper and more supple and I could just go on and on. I actually got back into using it because I'm noticing more and more fine lines on my skin and I just feel that a little lift gua sha provides will do me some good. Who cares if I sound vain, that is how I feel. But besides immediate improvement in that, I always notice that my skin just overall looks better. So yeah, definitely try it out if you haven't already! I got my Rose Quartz Gua Sha Tool on Etsy, but there are loads of places you can get it. Have you tried any of these products? Are you always on the hunt for amazing brightening products too? Hi lovelies! 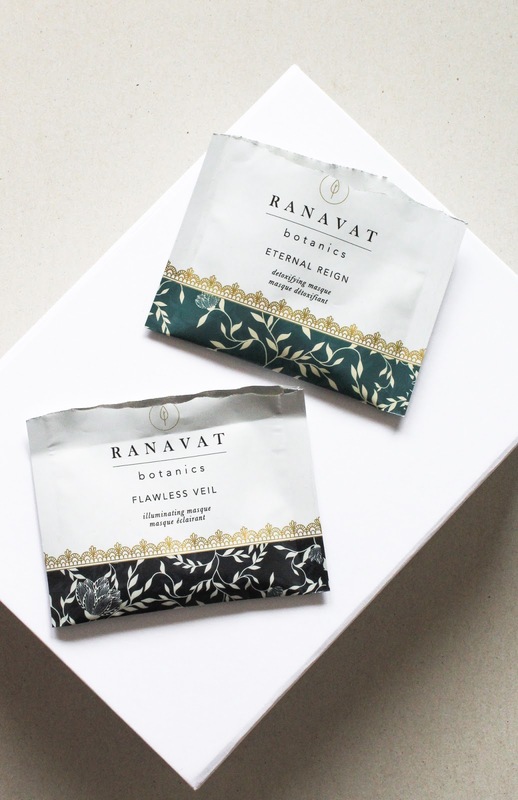 I'm back with another Indie Beauty Spotlight Discovery by Beauty Heroes, this time with the Ranavat Botanics box which I quickly fall in love with. 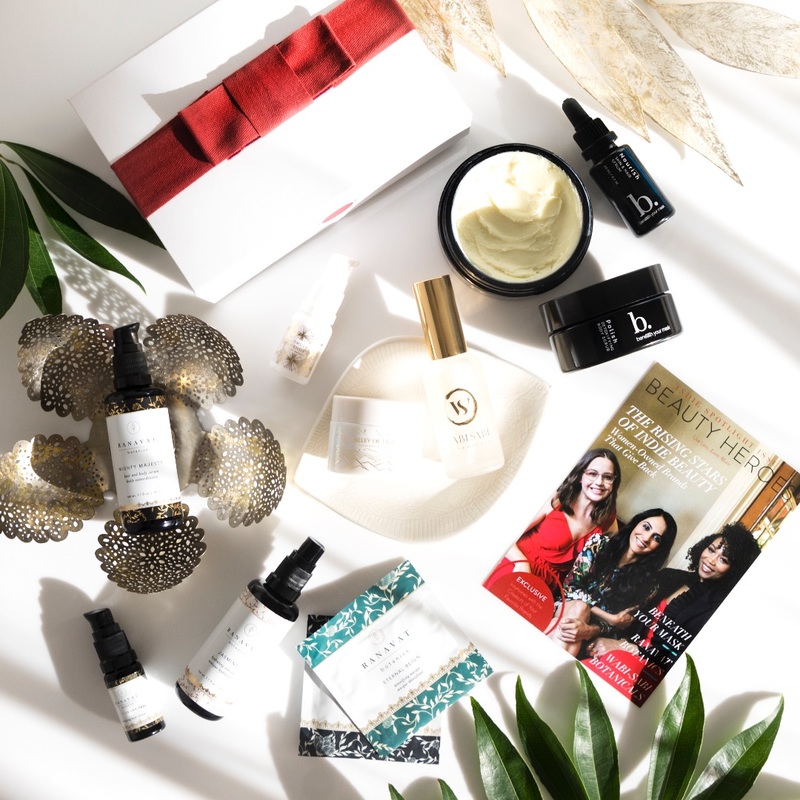 If you don't know what I'm talking about - Beauty Heroes curated three boxes or discoveries featuring three woman-owned indie beauty brands who give back to the community. They packaged them all neatly into these beautiful boxes all ready to be given as gifts. I have already reviewed the Wabi-Sabi Botanicals discovery (see here) and today is time for another one - the Ranavat Botanics. 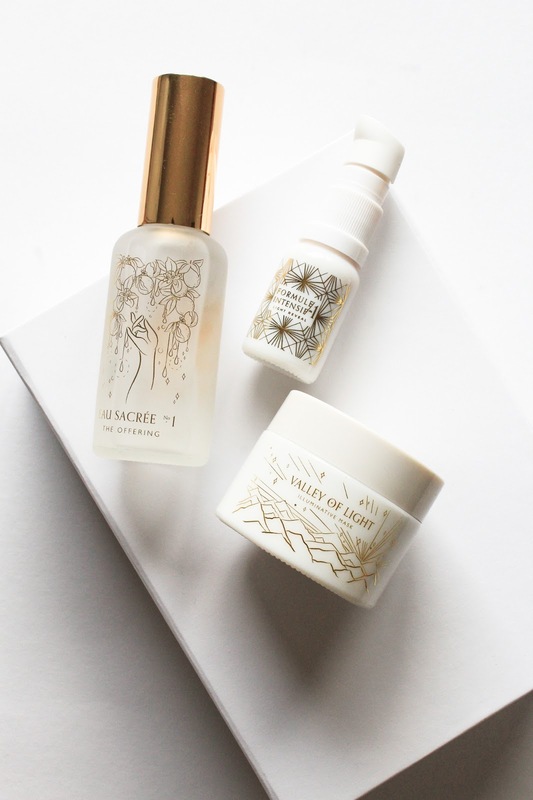 In the Ranavat Botanics Indie Beauty Spotlight Discovery* you will find 5 products: Mighty Majesty Fortifying Hair + Skin Serum (50 ml), Jasmine Tonique (50 ml), Radiant Rani Illuminating Serum (7 ml), Flawless Veil Illuminating Masque & Eternal Reign Detoxifying Masque (both come in single-use sachets). You can check out this discovery here. 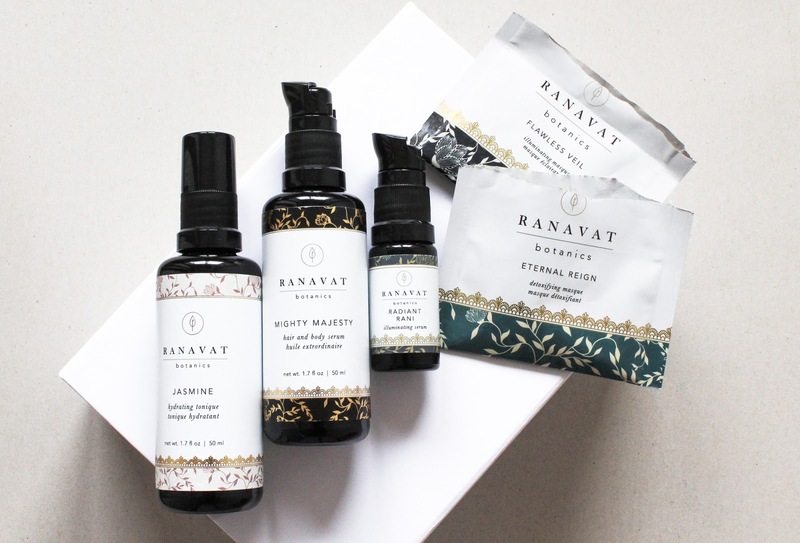 Ranavat Botanics is an Ayurvedic skincare line founded by Michelle Ranavat. 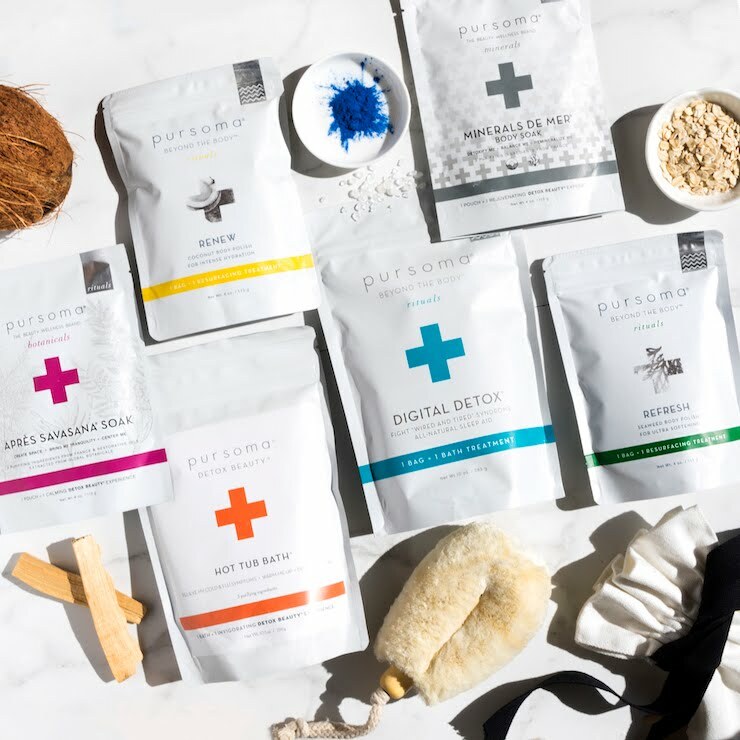 Michelle was inspired by the traditional Ayurvedic treatments passed down to her, and over the years saw first-hand the potency and efficacy of traditional Indian botanicals. Her background in engineering inspired her to modernize these treatments and craft an Ayurvedic skin care line that was based on the principle of “ingredients first” – extracted purely to keep all vitamins, minerals and skin-enhancing properties as close to nature as possible. I have to say I really enjoyed scrolling through their website (check it out here) and the style of writing is so beautiful. 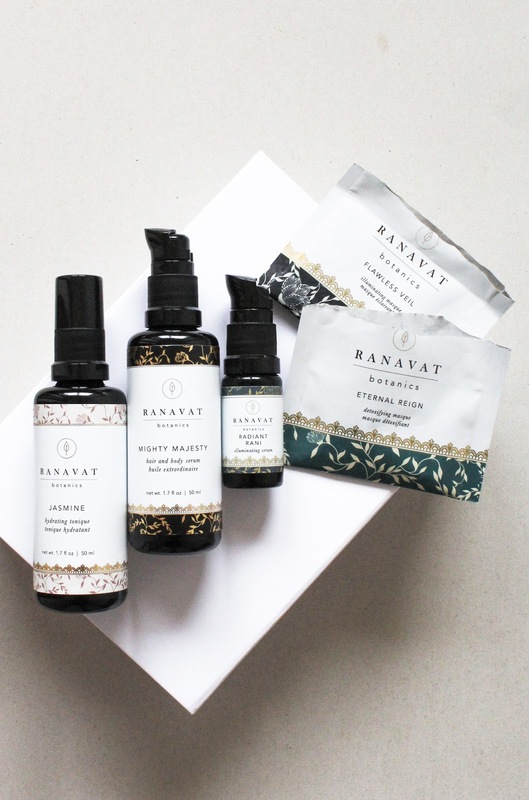 They say that "Ranavat Botanics is: a way for you to connect with tradition, magical botanicals and your personal ritual. You are ROYALTY when you hold our treatments because of the history and incredible craftsmanship that goes into each and every drop." They want to make us feel special and they certainly exceeded my expectations. Michelle's products do make me feel special. As for the giving back part, Ranavat Botanics gives 2% of proceeds to Ignite Hope, a non-profit organization that contributes to Rescue Foundation in India: a registered, non-profit, grass root NGO involved in rescue, rehabilitation & repatriation of victims of human trafficking and subjected to Commercial sexual from India, Bangladesh, Nepal. Jasmine Hydrating Tonique is a facial mist made with one ingredient: Organic Steam Distilled Jasmine Petals. The Jasmine used is grown in a garden on the west side of India - where each spray brings us close to the intoxicating scent of night blooming Jasmine. You guys! The scent of this mist is heavenly divine!! I have said it before but these products, this discovery is for those of us who love and adore the magical Jasmine. I love spraying it on my face morning and night, before I apply my serums and oils, and sometimes even after just because I love the scent. The spray mister could have been just a little better (but now I'm just nit-picking) - I just wish the mist was finer and a bit more delicate. But that's my only "complaint", otherwise it's a gorgeous product. 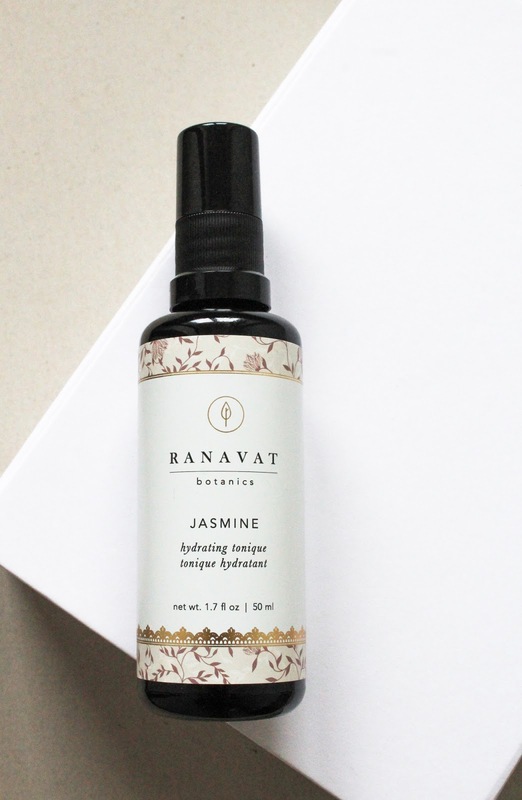 You can get Ranavat Botanics Jasmine Tonique here. Mighty Majesty Hair and Body Serum was the first product I tried from them and OMG, it's stunning! Again, the scent is so bloody amazing and wonderful, I can't get enough of it. The ingredients are as with Tonique, very straightforward and minimalist. There are only three: Certified Organic Sunflower Oil, Organic Jasmine Oil, Organic Amla Extract. Amla is rich in Vitamin C and is an ingredient long used in Ayurveda. Supposedly it reduces the appearance of discoloration and promotes a sense of strengthened hair follicles, diminishing signs of breakage. Am yes please. I love to use it as a pre-wash hair treatment: I generously applied it on the ends of my hair and I end up massaging it all over my hair, even and especially on my scalp. Aren't head massages the best thing ever? So yeah I'm definitely gonna apply the oil on my head as well and give myself a quick massage. And don't you think oils are not for you if you have oily scalp. If it weren't for dry shampoo I would need to wash my hair every two days and I don't see any problems at all with applying oils on my hair & scalp. It's the same with oils on oily skin, no need to be scared of them. Anyways, Mighty Majesty makes my hair softer and smoother and I sometimes also apply only a tiny little bit to the ends of my freshly washed hair so that they smell all nice. I don't use the product as a body serum, cause I honestly don't feel like using it too fast but I do use it sometimes as a perfume oil. LOVE. 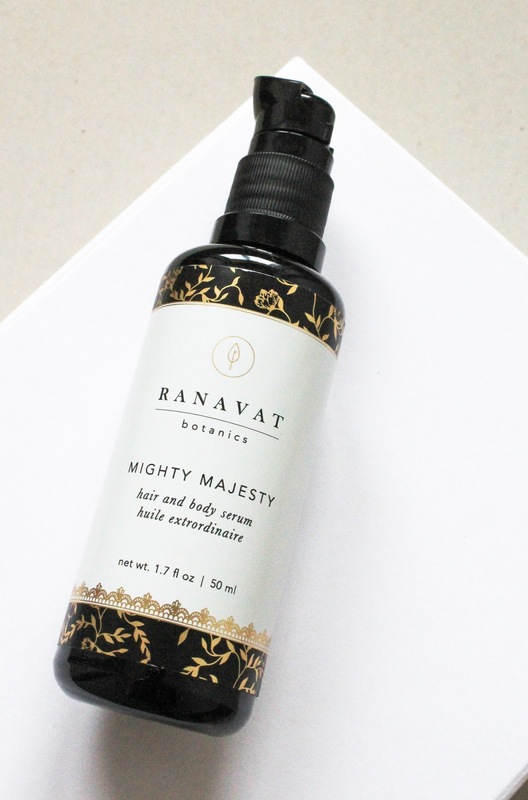 You can get Ranavat Botanics Mighty Majesty Hair and Body Serum here. Radiant Rani Illuminating Serum is a facial oil which I fall hard for. I'm so sad Beauty Heroes only featured a small, 7 ml bottle of it cause it's so beautiful! Ok I did start practising gua sha every day for the past week but still, I find that Radiant Rani really helped to reduce redness in my skin and I'm all about evening out my skin tone. There are some pretty interesting and unique ingredients in this oil, including my one true love Turmeric, which is super anti-inflammatory and brightening. In a blend of Sesame and Rice Bran Oils are Saffron, Nutgrass, Vetiver, Licorice Root, Himalayan Cherry, Indian Barberry and more ingredients unknown to me. There is this one ingredient called Flame of the Forest (Butea Menosperma) and I'm over here thinking to myself "what is this beauty and where can I get it??". Quick google search tells me that Flame of the Forest is a medium sized tree native to India which comes alive from January to March when it truly becomes a tree of flame, a riot of orange and vermilion flowers covering the entire crown. Well it does sound rather lovely. But what does the blend of these ingredients promises? With Radiant Runi you should unveil a bright, rejuvenated appearance, the oil promises to reduce the appearance of dark spots and visibly brighten the skin but still keep it moisturized at the same time. This oil is lightweight, it is quickly absorbed into the skin, it is indeed brightening and it evens out the skin tone. I really love using it, especially mixed with the Wabi-Sabi Botanicals Light Reveal*. The combination of both has really been great for my skin. Oh and I should also mention that Radiant Rani has a beautiful scent of Rose with a hint spiciness. You can get Ranavat Botanics Radiant Rani Illuminating Serum here. In this discovery are also two sachets of two Ranavat Botanics face mask. First is the Flawless Veil Illuminating Masque and this is the mask I tried first, since I'm always very intrigued by products that promise brighter, more radiant complexion. 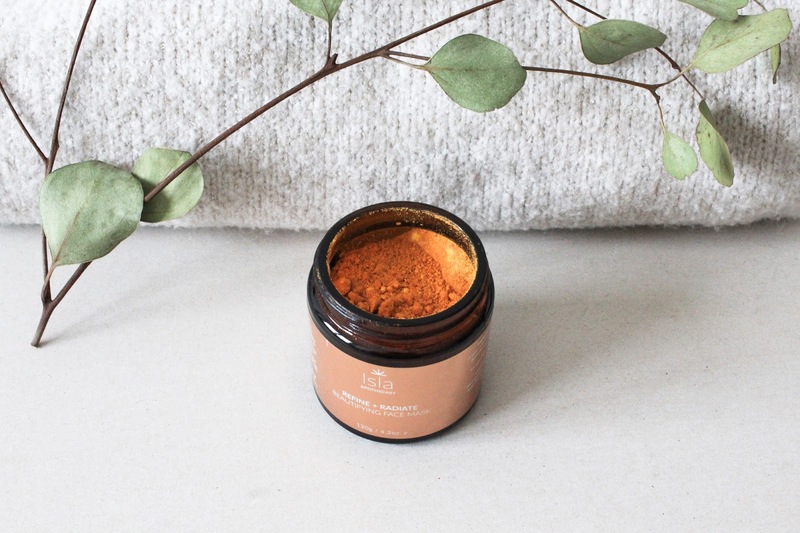 This powder mask contains Manuka Honey Powder, Wild Turmeric, Bakuchi, Licorice, Arrowroot, Saffron. It also contains two clays: Fuller's Earth Clay and Benotnite Clay. The second mask is the Eternal Reign Detoxifying Masque which also contains Manuka Honey Powder and Benotnite Clay, but also French Green Clay, Neem. gotu Kola, Moringa, Arrowroot and Vitamin C. I mixed both masks with some water, a couple of drops of Radian Rani and raw organic honey. They both felt great on the skin, I didn't experience any redness or irritation and I would love to have full sized jars of them. You can get Ranavat Botanics Flawless Veil here and Eternal Reign here. I would highly recommend this Ranavat Botanics discovery to everyone but especially to those who love floral scents (perfect for jasmine lovers!!) and to those who would like to try some new brightening products. I'm very impressed and I look forward to trying out more products from Michelle. I haven't mentioned the packaging and design yet. No surprises there, I really like it! 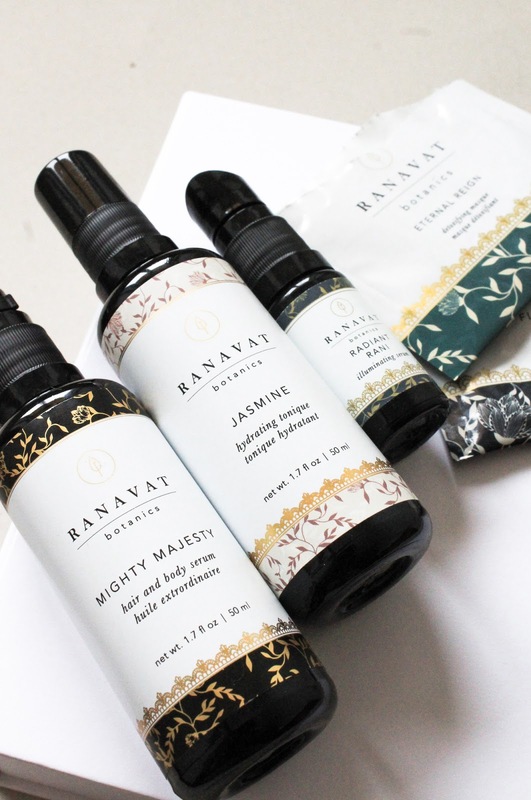 You can get Ranavat Botanics Indie Beauty Spotlight Discovery here. 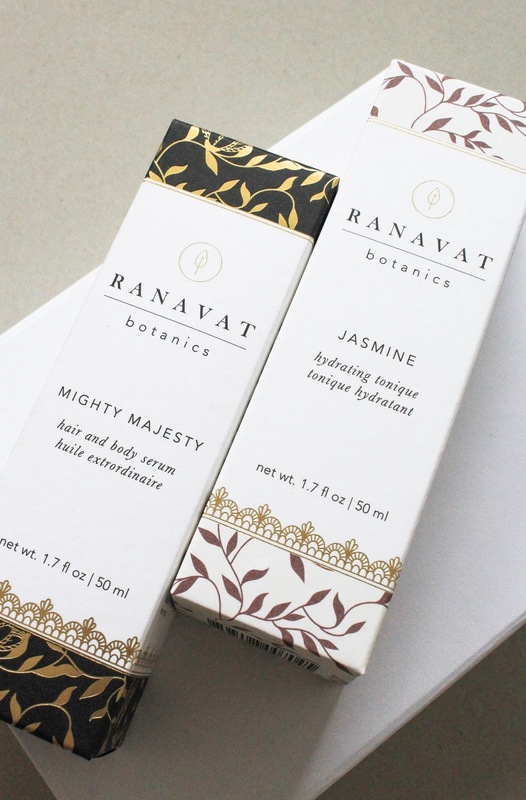 You can also shop Ranavat Botanics at Beauty Heroes (check out their selection here). 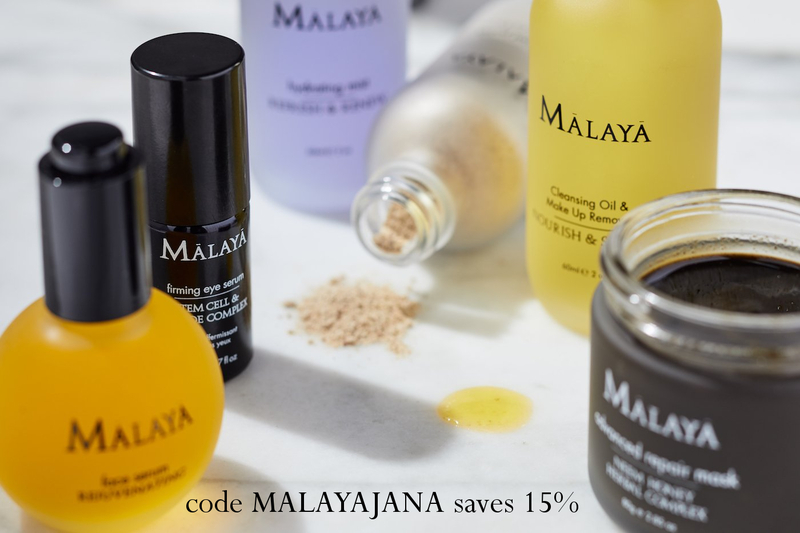 If you are a member you will save 15% (the same is for this discovery and every other - those who are subscribed to monthly Beauty Heroes boxes, can always save on limited edition discoveries). 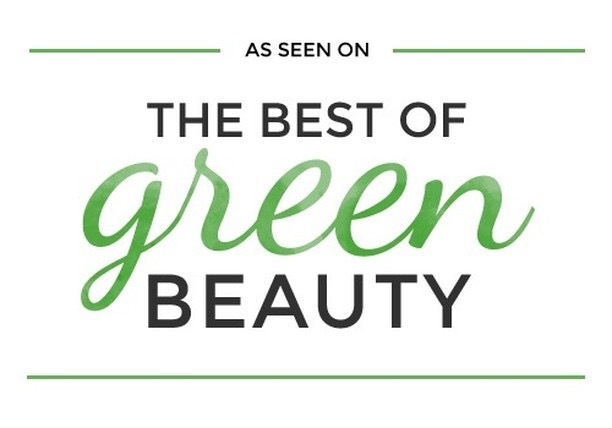 Find the other two Indie Beauty Spotlight Discoveries here. What do you do when you're not feeling your best? When you're having a bad day? When you don't know what you're doing with your life? When you just don't feel right? When you don't feel like yourself? I've been feeling on and off all this & more for the last couple of weeks and it's not that fun. I love that my blog is a happy and positive place but as I'm writing this I'm just like meh & blah. I hope none of you are feeling this way but if you do (bless you) then here are some of my tips that may help you out. 1. Surround yourself with your loved ones, with your family, friends, spend more time with your beloved animals, if you have any. Don't think you have to do this on your own, share your feelings and I'm sure that will make you feel better. Hopefully you will feel understood and perhaps someone else in your friend circle will know & understand what you're going through. I find that talking about things that are going on in my mind is really helpful. Problems don't seem that big anymore and once you speak out all or some scenarios you made up in your mind, you get perspective and see that maybe you're (slightly) overreacting. I'm so grateful for the support of my friends. I can talk about anything and everything and they don't judge me but rather understand me (as much as they can) and give me some excellent advice without pressuring me what to do or how to feel. I read this quote the other day that it's okay to take time to think and understand how you feel about something - if you need more time then give yourself more time to understand how you feel. No pressure. I find this really reassuring, especially since it's in my nature to always weigh pros and cons. It's hard for me to make a decision but I think I should start saying to myself that sometimes it's okay be a little selfish and to put myself first. 2. Go in nature. That will always be one of my favourite things to do, no matter if I'm feeling happy or sad. 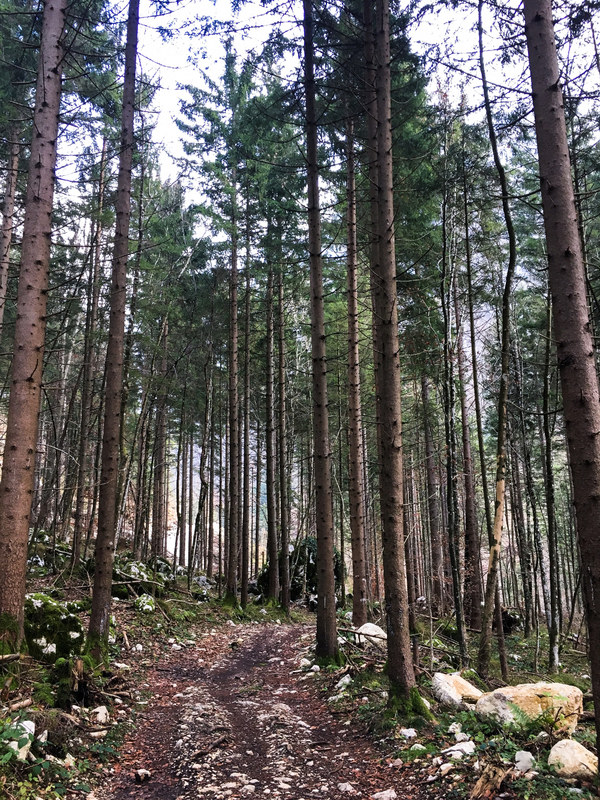 Forest bathing is definitely a thing and walks through the forest always make me feel better. Always! I'm less stressed out, less in my thoughts and I just feel like everything is going to be okay. Meditation is also great with all this, but to me walks and hikes are so much easier. I can easily take one hour and go outside but I can hardly find 10 minutes to mediate. Yes, I know I'm funny like that. 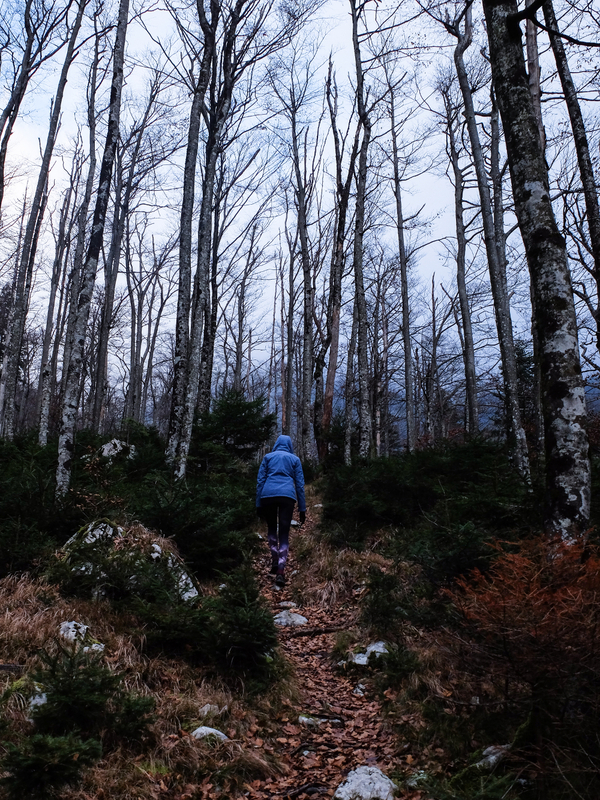 And if you can't go out in the nature, then go for a walk in the city or in the gym. 3. Write down your feelings, problems, concerns. I'm that sort of person who doesn't always like to confront their problems and I'm too good at bottling down my feelings. That is never a good thing so if you don't feel like sharing your problems with others (which is perfectly fine too) you can always write them down on a paper or in a journal. 4. But above else, do the things that make YOU happy or happier. I highly encourage you to do what you love most and try to forget about your problems, only if for a little bit. Take a bath, read or listen to a good book (I'm still listening to Harry Potter, already on book 6), watch a good TV show but try not to do it all day long even though sometimes that's all you want to do, still try to be somewhat productive (that's why I'm writing this post, cause I would feel worse if I'd just lay on the couch and watch TV), eat some delicious and nutritious food (I'm dreaming of a good soup and pad thai rn), slap on a face mask and pamper yourself, listen and dance to music, exercise (but that's not usually the thing I like to do when I'm feeling down even though it would be beneficial because of all the endorphins) and the list goes on. Know that your problems will pass. You can do anything. You're brave, courageous, smart and beautiful. You are so loved. More than for you I feel like I wrote this post for myself, but I hope you liked it too. You may have already seen on my Instagram (see here) that Beauty Heroes recently came up with new Limited Edition Indie Beauty Spotlight Discoveries, and they are all about three indie beauty brands. Beauty Heroes is really stepping up their game and this year has truly been amazing for all of their discoveries, but especially their limited edition discoveries. Their newest LE discovery isn't actually the one I'm going to be talking about today but I'm still waiting for that one to arrive to me. Since it's selling out fast I still want to mention it quickly - Beauty Heroes launched Lifestyle Discovery featuring DINO Apparel (you can check it out here). I went with the Everywhere Pullover in Red Velvet and I'm so excited to receive it. Reviews thus far have been very positive, everyone is saying how very soft and comfortable these clothes are and I'm really looking forward to wear my pullover. Will definitely let you see how it looks on me when it comes, hopefully soon. For now that is all about the DINO Apparel Discovery so let's get back to the Wabi-Sabi Botanicals Indie Beauty Spotlight Discovery. 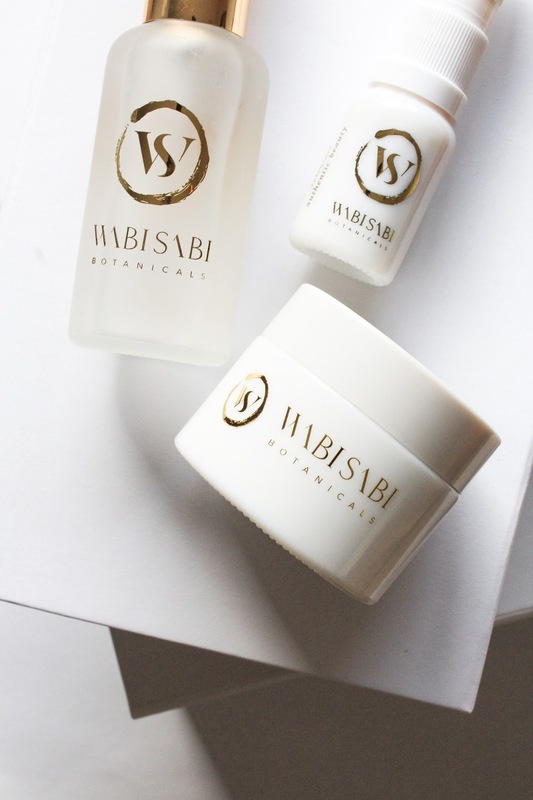 There are three Indie Beauty Spotlight Discoveries but today I'm going to talk only about one, the Wabi-Sabi Botanicals Discovery*. 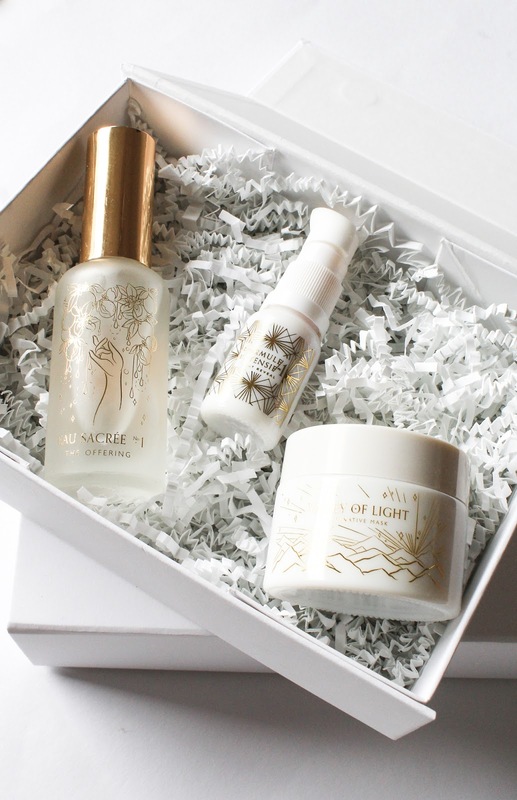 In the box, which btw would be an amazing gift, are three products: The Offering Ageless Ritual Facial Mist, Light Reveal Targeted Treatment Serum and Valley of Light Illuminative Mask. You can check out this discovery here (and you can also check out the Ranavat Botanics and Beneath Your Mask discoveries). Oh Wabi-Sabi Botanicals, I love thee. I mean what is not to love about this brand?? While reading their website and the philosophy of the brand I'm like yes, yes, YES! Wabi-Sabi Botanicals was founded by Elysse Crabtree, and she is just so adorable, sweet and friendly. And also knowledgeable. 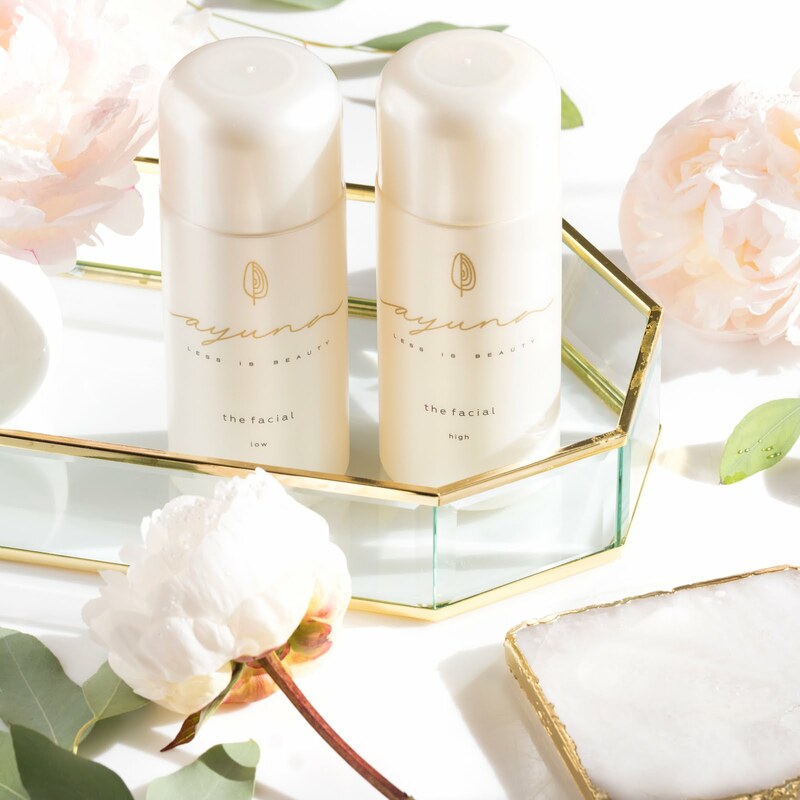 Understanding what it’s like to have sensitive, acne-prone skin, Elysse has created a skincare line that is targeted, concentrated and effective. Their ingredients are purveyed from small-scale artisan producers, family-owned farms, and women-centered co-operatives around the world. In alignment with their mission, they place a special emphasis on co-operatives organized for empowering women by paying them fair, living wages for their work. They use carefully selected ingredients that meet their high standards: they use Organic or Organically Grown Wild-Harvested plants, they support Fair Trade practices by sourcing ingredients that are sustainable for producers, their communities, and the environments they live in. For this reason, their products are 100% Palm oil and Palm oil derivative-free. Yaas! Wabi-Sabi Botanicals products are also vegan and they also don't use a lot of essential oils, if any. The three products I'm going to mention today are free from essential oils. Find more information on the ingredients they use here. The Offering Ageless Ritual Face Mist. 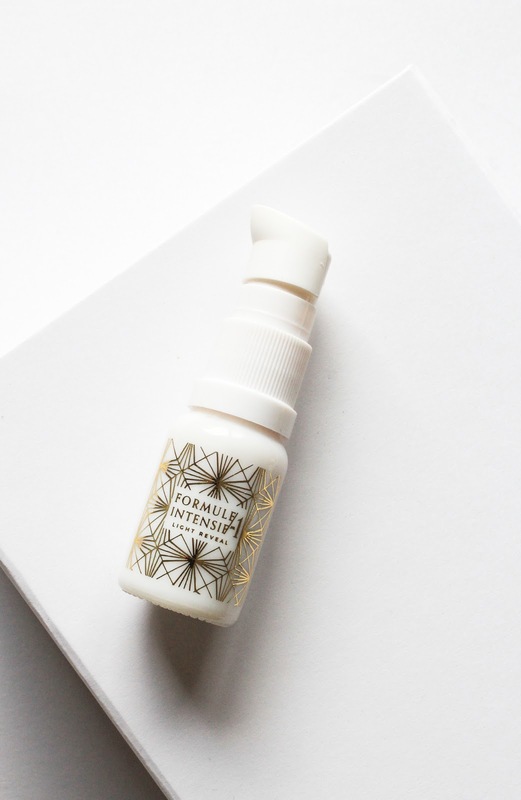 I'm not quite sure when it happened, but Wabi-Sabi Botanicals recently went through a rebranding and they launched some gorgeous new products, this mist including. First of all I want to talk about the absolutely stunning packaging of Wabi-Sabi Botanicals products, especially this mist. The picture of hand, fruits and flowers is just so beyond stunning and I really adore it! The whole gold on white theme of the other two products is something that isn't widely used in skincare products and I love the uniqueness of them. I didn't take any photos but all these products came in black boxes with gold writings and they're equally beautiful. I established my love for the packaging, I think, now what about the products themselves? The Offering face mist was carefully crafted with a blend of black Omani and white Carterii Frankincense to make skin feel toned and tightened. Earthy aroma of Frankincense is mixed with floral notes of Lebanese Orange Blossom and Blood Orange. It's a lovely, grounding scent and I've been really enjoying using it. You know I prefer to use aloe vera based facial mists because I find them more hydrating than just pure hydrosols, but there's just something about this one that I really love. It's probably the fact that I find it so beautiful and the scent is just so nice and different to what I have. I'm really intrigued by other Wabi-Sabi Botanicals facials mists, they all just look and sound gorgeous. 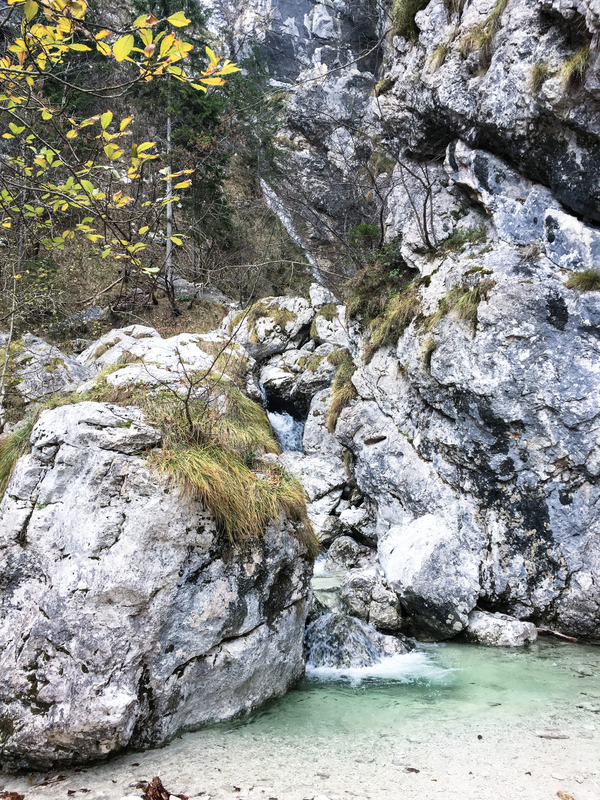 Besides The Offering, they also have Heart Rising, with White Rose, Jasmine, Sandalwood and Agarwood (check it out here) and Still Waters with Lavender, Tulsi and Lemongrass (see here). Give them a try, I think they're worth it. You can get The Offering Ageless Ritual Face Mist here. Light Reveal Targeted Treatment Serum is the second serum I've tried from them. The first one I just recently finished and that was the Age Gracefully from the Art of Organics Clean Beauty Box (see my review here). 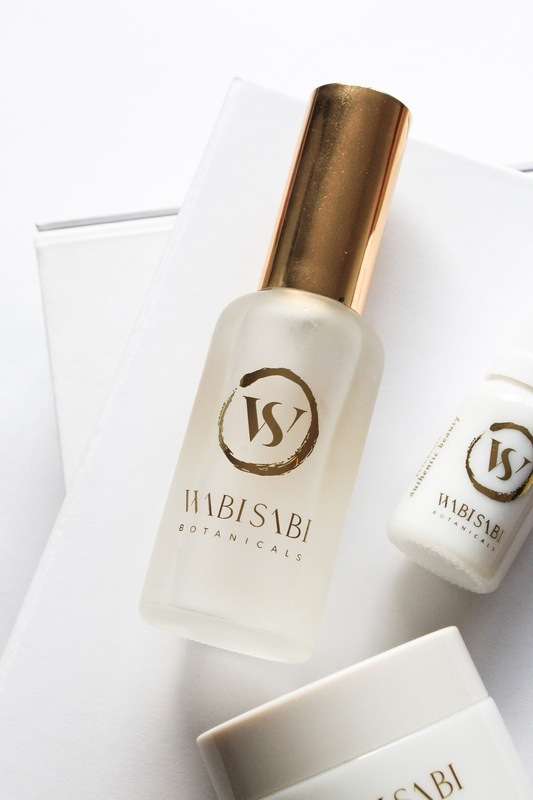 I loved that little serum so much and so when Jeannie (the founder of Beauty Heroes) said they will be featuring one of Wabi-Sabi Botanicals serums I was like yes please, I cannot wait to try more! Light Reveal is the answer to a rejuvenated, glowing appearance. This skin moisturizing serum is designed to restore a look of luster and health to tired, sallow skin. It contains only a number of ingredients: Andiroba & Buriti Oils visibly diminish the appearance of inflammation and redness, bringing out an even toned appearance, Guarana promotes a look of radiance, while Pequi is used to lend a nourishing feel to dry skin. Sea Buckthorn offers skin conditioning effects that promote a look of clarity, reduce the appearance of sun damage, and lend a restorative look to the complexion. This targeted treatment serum promises brighter, lighter, more brilliant looking skin. It has an amazing, vibrant orange colour which I love terribly and a stunning sweet and fruity scent of Pequi Fruit Oil, which is blowing my mind. There are no essential oils and I actually had to check the description to figure out what I was smelling. Mmm its fruity sweetness is making me happy. This serum has quite a thick consistency, meaning it's not as liquid as we're used to when it comes to facial oils. It's actually quite strange - the texture is almost balm-like but the oil is drier and not heavy at all. Of course the consistency slightly varies on the temperature. I was surprised to learn it's super lightweight and is instantly absorbed into the skin. 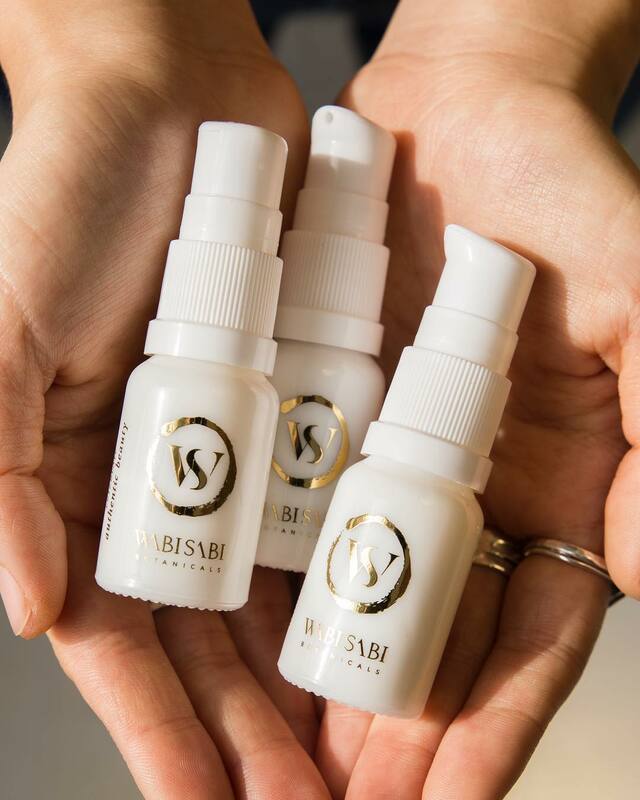 Wabi-Sabi Botanicals Targeted Treatment Serums come in 10 ml bottles and they are designed to be used, as the name suggests, as targeted serums, as treatments. Of course they can be used on their own but what I like to do is combine them with other products, especially oils. In the mornings I have been loving it mixed with Maya Chia Supercritical Pure Chia Face Oil* (from Level Up Discovery with Sarah, which is still available and would also be a wonderful gift) and in the evening I either apply one drop on its own and use it where I have the most problems with redness and hyperpigmentation, or I mixed it with my beloved Fleurs d'Afrique Intensive Recovery Facial Oil* by African Botanics from a Boxwalla Beauty Box (review here). Light Reveal isn't an instant solution and doesn't lighten my skin with just one use (which you know is rare) but with consistent use I noticed a slight reduction in appearance of my hyperpigmentation spots aka this random redness on my skin. It's very lovely indeed. You can get Light Reveal Targeted Treatment Serum here. 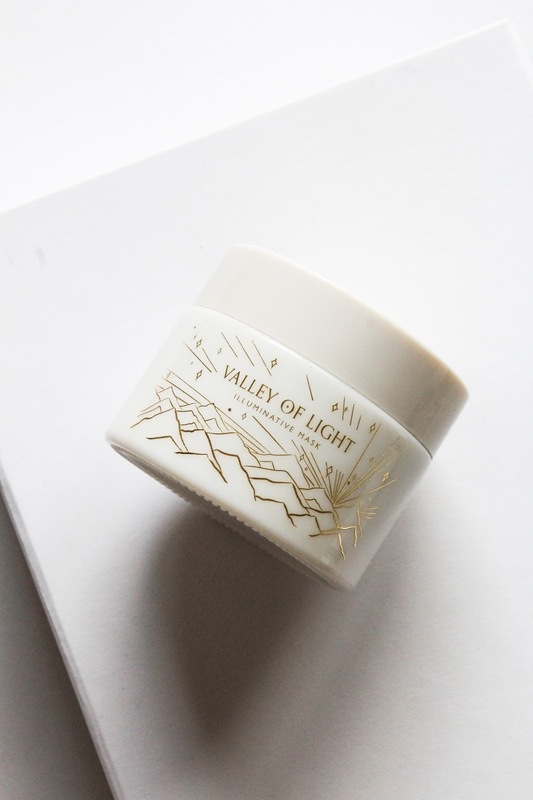 Valley of Light Illuminative Mask is the third product of this limited edition beauty discovery. 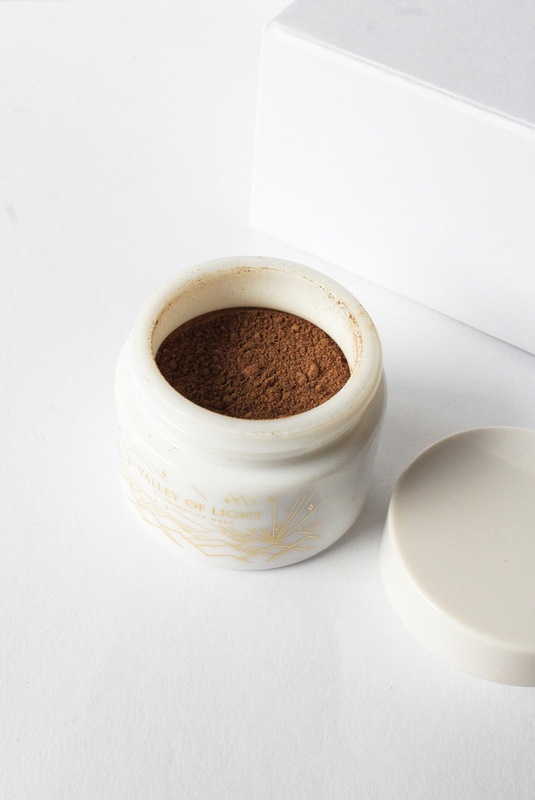 This is a powdered mask rich in antioxidants from pure Balinese Cacao and finely-ground Arabica Coffee that will leave your complexion looking soft and luminous. This botanical blend features Hibiscus, Red Ginger, Temulawak (Javanese Ginger) and Fermented Reishi Mushroom all working synergistically to create a radiant glow for every skin type. This mask promises a look of smooth, youthful skin, enhanced appearance of brightness and clarity and visible improvement in lines and discoloration. It's a beaut! It has a rich aroma of raw cacao with a hint of coffee. As this is a powder mask you can mix it with pretty much everything you like. I love mixing it with water and a little bit of honey, or you can mix it with The Offering and Light Reveal to give it that extra boost. What I highly recommend is mixing it with water and Maya Chia Supercritical Pure Chia Face Oil* which has a citrusy scent and I swear the mixture smells like chocolate and oranges, it's divine! I leave the mixture on my skin for about 20 minutes and I mist it with water so it doesn't dry up on my skin. I always do that with masks, I think they are more active and beneficial like this. After rinsing it off my skin is always left very soft and supple, really beautiful. Mask is also exfoliating and my skin also looks a bit brighter and more radiant after I use it. Some have called this product the Hero of this discovery and they may be right. I'm really impressed with it too. You can get the Valley of Light Illuminative Mask here. I'm completely and utterly in love with this particular discovery and I highly recommend it. I love all three products and I find them suitable for most skin types. They don't contain any essential oils which is always a plus in my opinion, so even those with sensitive skin type can use them. I have to say that my first impression of this discovery was truly amazing. When I tried them all for the very first time (saved in my "beauty heroes" Highlights on Instagram) I thought to myself "OMG I love you already!". And I do. I would like to end this post saying that Wabi-Sabi Botanicals is one of those brand that gives back to the community. 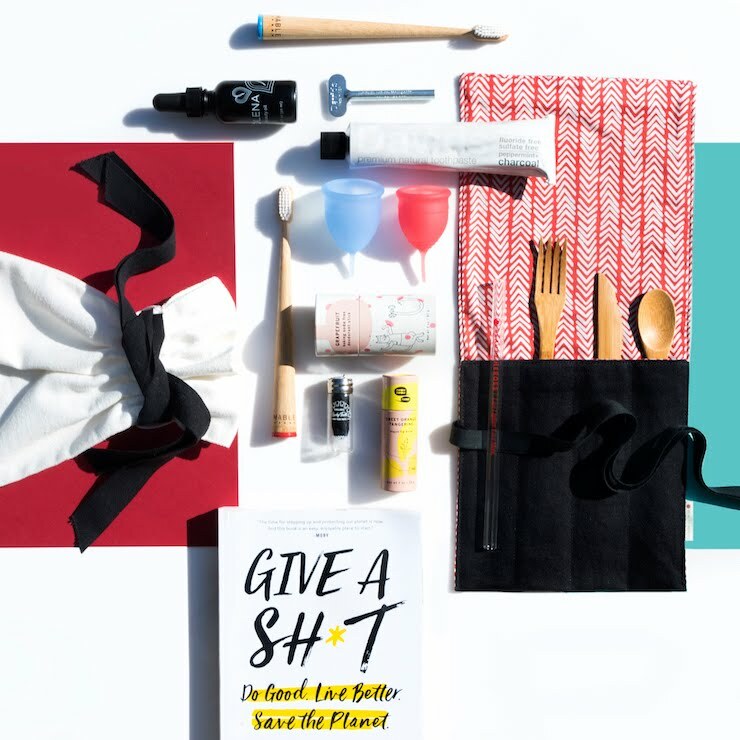 Every month, they set aside 10% of proceeds to invest into Kiva micro-loans for women, and every purchase directly supports a woman’s dream of starting or growing her business, getting an education, or serving her community. Kiva is an international nonprofit, founded in 2005 and based in San Francisco, with a mission to connect people through lending to alleviate poverty. Kiva celebrates and supports people looking to create a better future for themselves, their families and their communities. Over 2.6 million people in 86 countries have received loans through Kiva. Find more info on this here. 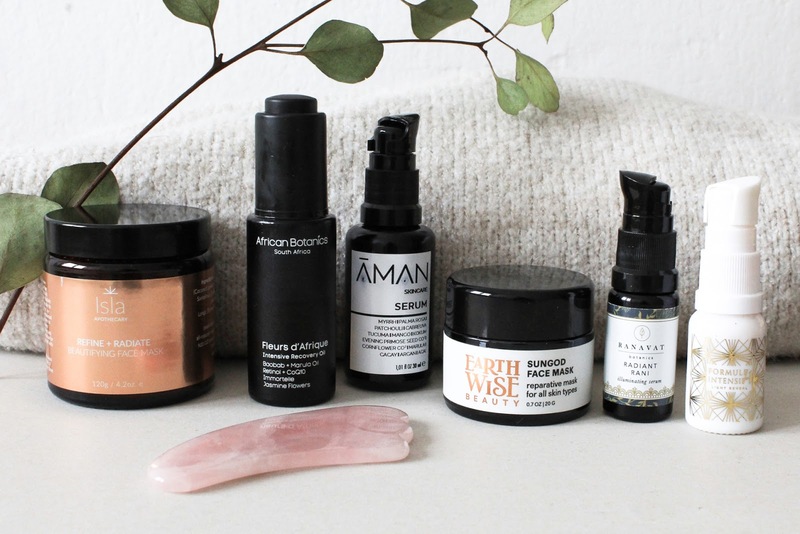 Giving back to a cause of their choosing is something that all three indie brands (Wabi-Sabi Botanicals, Ranavat Botanics and Beneath Your Mask) from this limited edition Indie Beauty Spotlight Discoveries are doing and I love that. 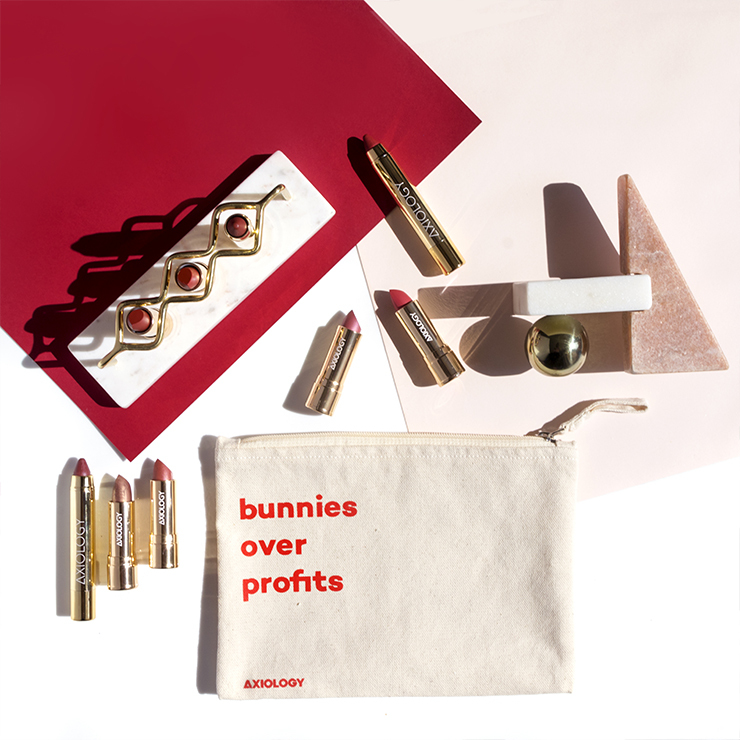 Over and above what each brand contributes to their cause, Beauty Heroes is donating $2 per discovery to their charity. So amazing! 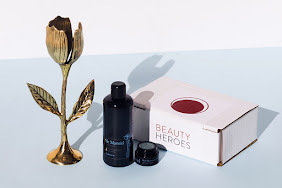 This limited edition Wabi-Sabi Botanicals Indie Beauty Spotlight Discovery is valued at $128 and you can get it for $69. You can get it here. Don't forget to check out the other two, both woman-owned indie brands that give back - more info here. Oh and I almost forgot to say happy December!! 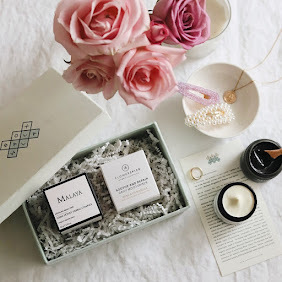 New month brought us the NEW monthly Beauty Discovery featuring the beautiful max and me. Check out the new discovery here. I'm here for you if you have any question. Have a wonderful Sunday!